On the 27th of July, 1967, a group of works was inaugurated at Grantierra, a remote area in the eastern end of the island, which included a small settlement which I had designed using "Sandino" System prefabricated houses (system originally known by the name of its author, Architect José Novoa) as well as 9 mountain internships and 8 nurseries. In his inaugural speech, Fidel Castro announced his housing construction plans: "As of next year we will be able to increase housing construction greatly and by 1970 we shall be able to construct some 100,000 living quarters a year. Therefore, between 1970 and 1980 1 million houses must be built in this country." This would be possible, he affirmed, thanks to the "mechanization of construction". He was not referring here to the system used by us for the Grantierra housing. One of the merits of this system was precisely the little need of mechanical equipment. At that time, "mechanization of construction" in housing usually meant a technology which was introduced in the USSR by the Nikita Khrushchev administration, and brought to Cuba with its incorporation to the socialist bloc in the '60s: those popularly known there as Khrushchyovkas (in Russian: хрущёвка), prefabricated apartment buildings built from large concrete panels. These buildings were originally considered in the USSR as a temporary solution until the housing shortage was definitively resolved with what was expected to be the impetuous development of socialist economy. But the use of reinforced concrete only would not solve the population's housing needs. The construction of 100,000 houses per year also involved the manufacture of furniture for these dwellings, a task also to be fully assumed by the state, since at the beginning of the same year 1968 all private carpentry workshops had been confiscated. This would be the Ministry of Light Industry's task and the study of how to achieve this goal was entrusted to our Department for the Development of the Furniture Industry. Many of us considered the "Great Panel" technology -then promoted by the Ministry for Construction (MICONS)- inadequate because of its rigidity and high cost, as it used heavy panels of reinforced concrete not only for external closures but also for all of the interior partitions. There were proposals in the university environment of other prefabricated systems but they had little acceptance by the administration. An example is in the Multiflex system, developed under the guidance of Architect Fernando Salinas in whose furnishings our design team worked. In order to present our ideas on the use of lightweight partition systems and furniture as a means to structure the dwelling's interior space we prepared an exhibition in the halls of the Furniture Industry Prototype Workshop on the Almendares River. Here a complete housing equipment solution was proposed, advanced both from the technological point of view and in terms of design quality. The prototypes included in this exhibition were, from a technological point of view, the result of more than two years of research. As a result, we had reached a quite precise definition of the materials whose production was necessary, of the most appropriate technologies in each case and some general principles of construction and design. This included studies of demand forecasting, capacities to be installed, etc. Some fundamental theoretical definitions that guided our work were derived from the recognition of storage as the main unresolved problem at that time -and even now-, the distinction between storage furniture and other furnishings, and the contribution of lamps -illumination- and industrially produced graphics -color- in the characterization of the housing environment and its possible variations. This research was carried out by the multidisciplinary team in the Furniture Development Department, and included visits to Czechoslovakia, Romania, Poland and finally to Italy, where we were able to get acquainted first hand with the Milan's leading furniture industry. During these studies and in particular in the preparation of the visit to Milan we had the enthusiastic help of Mauro Casagrandi, an Italian merchant living in Havana, then best known as the dealer for Alfa-Romeo cars. Based on those studies, we prepared the bid requests for the furniture manufacturing installations needed to satisfy the requirements of the 100,000 houses per year announced in the Grantierra speech. These investments would be financed by the yields of another one of the moment's star plans: the Ten Million Tons Sugar Harvest ("Zafra de los Diez Millones") announced for 1970. The sale of this enormous amount of sugar, whose purchase was guaranteed by the treaties signed with the USSR, would guarantee in addition to the money necessary to purchase the production capacities, the raw material for the boards that would be made with the residual sugar cane bagasse. It is worth noting in this context the visit to Cuba of Alberto Zevi, founder of ELMAG, the main Italian industry producing machinery for the furniture industry, a company better known then to us for Angelo Mangiarotti's design for its Monza plant built in 1964. With Zevi we discussed, among other things, the problems then present regarding particle board production from sugar cane bagasse. The boards produced were unsuitable for furniture due to their excessive weight and low resistance. With the technicians of the factory that then produced them at the town of La Salud we discussed the possible solutions, among them the use of the wood of species of fast growth such as the almácigo (bursera simaruba) which Zevi compared to the poplars used in Italy, instead of the bagasse, having in addition that many experts considered more advantageous to use it as fuel, which was the usual thing during the Republican era. 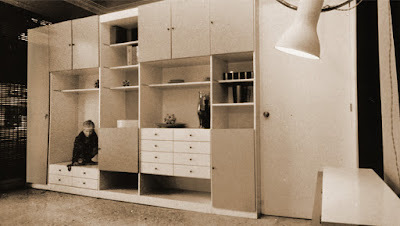 The system of modular panel furniture proposed by us used the most advanced hardware of the moment, such as the invisible and self-closing hinges that had been patented by Arturo Salice a little more than ten years ago, the cam lock nuts and screws that allowed the assembly without need of adhesives, adjustable supports for shelves, etc. These elements, imported from Italy especially for these prototypes were used for the first time in Cuba, being unknown to most of the technicians of the furniture industry then. In fact, they were similar to those that are still in use by companies such as IKEA for their modular furniture systems. As for the rest of the house equipment, unlike to what other Cuban designers of that time were working on, using precious woods and natural leather for the furniture intended for the offices of the senior leaders of the bureaucracy or the export market, we then called upon the use of industrial materials like aluminum or steel tubing, canvas and plastic cord as a way to satisfy the needs of the average Cuban. the built hollow is not housing's solution. The function of housing is not just protecting from the external environment. HOUSING IS A CONTAINER FOR MAN AND HIS THINGS BOTH USEFUL AND USELESS. when using things man engages in different groups of activities. each activity group needs its space and each thing requires its place. multiple uses: residential - schools - offices - hospitals - libraries - etc. Our proposal, so far removed from the official line represented by the all powerful MICONS, was not welcomed by the administrative structures of the moment. Anyway, the failure of the so much expected "Zafra de los Diez Millones", prevented the realization of all those investments we had studied and in which we pinned our hopes for the development of a Cuban furniture industry. Everything remained as prototypes and unique specimens. In none of the existing reviews about Cuban Industrial Design are we mentioned. Today we vindicate its existence with the few pictures preserved in our archives. Let it be so. Studied in the Havana Faculty of Architecture. Industrial designer specializing in children's furniture and school equipment. Ceramist, founding member of the Cuban Association of Craft Artists (ACAA). Architect, Havana University School of Architecture (1967) and the Seville School of Architecture (2000). Furniture Design Professor at the Havana School of Industrial Design and Associate History of Iberoamerican Architecture Professor at the Escuela Técnica Superior de Arquitectura in Sevilla. Member of the National Union of Writers and Artists of Cuba (UNEAC). Architect, Havana University School of Architecture (1966). PhD in Engineering, University of Cantabria (2003). Associate Professor, Faculty of Architecture and Assistant Professor, Institute of Industrial Design (Havana). Associate Professor for Graphic Expression, University of Cantabria (Santander, Spain). Member of the National Union of Writers and Artists of Cuba (UNEAC), the Cuban Association of Craft Artists (ACAA) and the Spanish Association of Professors of Graphics Engineering (INGEGRAF).